Turn everyday notes and messages into an evolving work of art with this beautifully framed magnetic and dry erase home-office assistant. It's a great way to add organization and function to your home without sacrificing style. This high quality, multifunction board has a magnetic board on one side and a dry erase surface on the other side. Write to-dos or reminders next to pinned up notes, photos, or artwork. Works as great in the dining room, kitchen and mudroom as it does in your home office. It features a rustic flat surface frame with an authentic painted look and distinct brushstrokes. Its finish is a true navy with natual wood showing prominently through brushstrokes, giving the frame the feel of shiplap at home in coastal, shabby chic or modern farmhouse decor.This multipurpose board with a 100% real wood frame is handmade in a small, custom art and frame shop in the American heartland. You will be proud to display it in your home. TWO MULTI USE SURFACES: Board contains a magnetic surface on one side and dry erase surface on the other layered over a solid backing for added strength and stability. 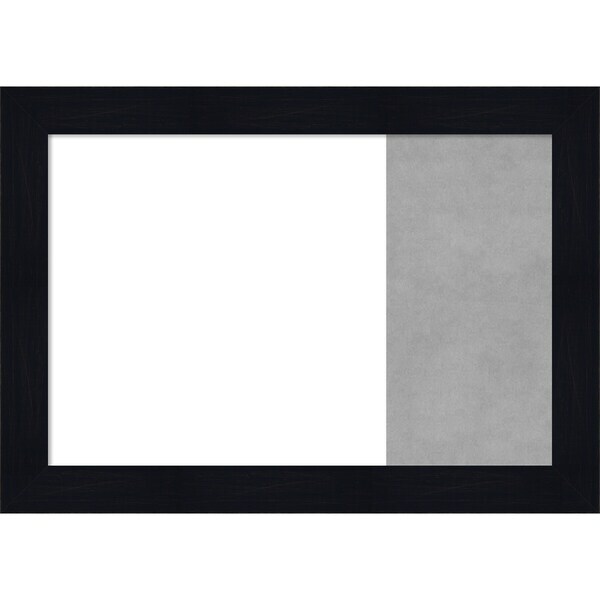 MAGNET BOARD: board is a solid magnetic steel / aluminum surface with a metallic silver finish. Works with any standard magnet. Magnets not included. DRY ERASE SURFACE: Write on surface wipes clean with an eraser or rag. Works with standard dry erase markers. Markers not included. QUALITY: Board is made with 100% real wood moulding and professionally handcrafted in Madison, Wisconsin. EFFORTLESS HANGING: Hardware included for easy installation and ready to hang vertically or horizontally in your office, mudroom or kitchen. Dimensions 0.75 In. X 31.25 In. X 22.25 In.